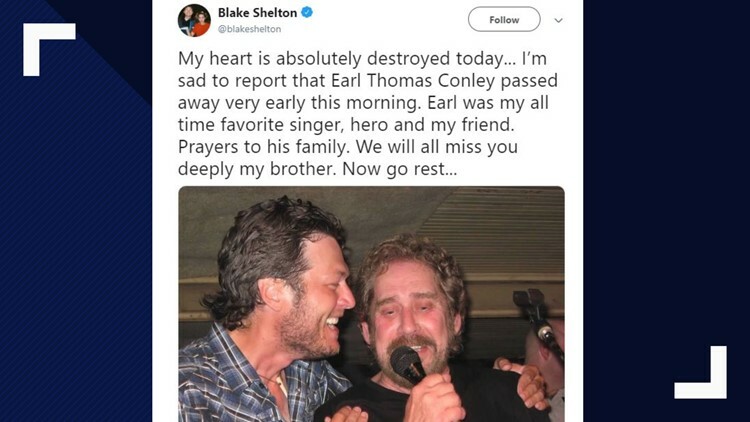 Country star Blake Shelton shared Wednesday that his friend and hero, singer Earl Thomas Conley had passed away. Country music star Blake Shelton shared that Conley, his all-time favorite singer, had died early Wednesday morning. Country musician Earl Thomas Conley has died. He was 77. Erinn Scates of Nashville is one of Conley's daughters. She says her father passed away early Wednesday in Nashville due to an extended illness. Conley was born in Portsmouth, Ohio. The music website allmusic.com says he charted his first Top 40 hit in 1979 with "Dreamin's All I Do." He sang a number of other hits, including "Holding Her and Loving You," ''Right From the Start" and "What I'd Say." Country music star Blake Shelton tweeted Wednesday that Conley was his all-time favorite singer, hero and friend. Shelton said his heart "is absolutely destroyed today." Scates said Conley was an incredible dad who would do anything for the people he loved.